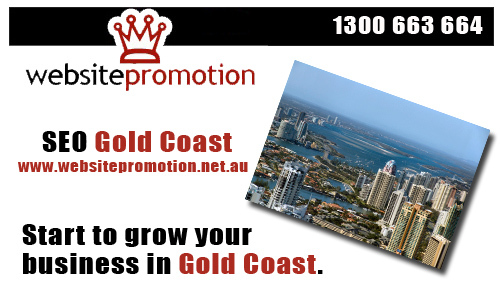 Website Promotion SEO Gold Coast division is located in Varsity Lakes. We have been serving the Gold Coast Region for over 13 years. Our extensive experienced as a Search Engine Optimisation specialists have proved methods that work we are an exclusive company that provides quality link building, effective online reputation management, branding management and search engine marketing. In addition to SEO, we also provide a wide range of services including web design and web hosting for small, medium and large business enterprise. SEO Gold Coast by Website Promotions guarantees result without overspending on your advertising budget. Contact Website Promotion today if you are looking for affordable Gold Coast SEO firm. Website Promotions offers a wide range of SEO Packages to help your business grow and dominate the Search Engines. Search Engine Optimisation provides opportunity for your business to get higher visibility online, drive traffic and gain lots of customers. Call 1300 663 664 now and learn how Website Promotions can help you and your business reputation.